A $10 million dredging project of the Cooper River's rowing course in South Jersey will finish up this spring, making water depth uniform and returning the course to one of the premier rowing venues in the country. When the stretch of the Cooper River between the dam at Route 130 and upriver at Cuthbert Boulevard is in good shape, it is one of the best rowing venues in the country. But river has not been in top shape for a few years. The course on the river, running between Collingswood, Pennsauken and Haddon Township, had become so shallow that crew equipment was getting damaged. Particularly vulnerable were skegs, the small fins that give racing shells their stability. “They were snapping off, getting damaged,” said Jamie Stack, who oversees the Cooper River boathouse. Races were sometimes slowed or even stopped due to shallow water conditions. “Races were being challenged a lot,” said Stack, who also works for Rutgers University-Camden. The good news: Water depth should no longer be an issue by spring. 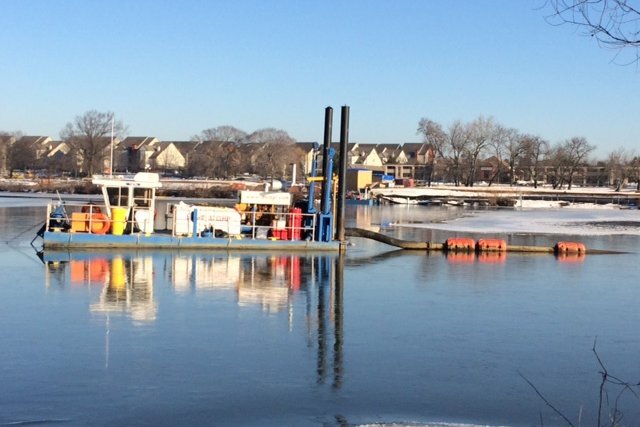 The river will likely reopen in April, but maybe a bit earlier – following a $10 million dredging project begun last August and soon to finish. But regatta competitions on the deepened river won’t resume until the fall, said Nash. The dredge spoils need time to drain and then trucked off-site, Nash said. Other upgrades to amenities continue in Cooper River Park, which rims the racecourse portion of the river. Those projects include stabilizing river banks to cut down on silting, planting more native species, revamping a restaurant which will be overseen by local chef Kevin Meeker, new walkways and docks, and adding and upgrading recreational facilities. The work will cost an additional $20 million, a mix of state, federal and local money. The work should restore the Cooper to its role as one of the prime rowing locations in the country. And crew is big business for the South Jersey region, bringing in more than $10 million annually, according to a 10-year-old study. Rowers like the Cooper course. “It’s a fairer course than the Schuylkill River,” said Stack, referring to the storied race course along Boathouse Row in Philadelphia. Fairer, said Stack, because the Cooper is a flat-out straightaway, unlike the Schuylkill. Also, the Cooper also has consistent water flows throughout the course and uniform winds across its reach, both of which are not the case on the Schuylkill. Row2K, an online publication for the rowing community found a lot to love about the Cooper in a 2013 article.